The marriage is a sacrament in Czechoslovak Hussite Church. The wedding ceremony contains prayer, biblical readings, promises, lacing the stole – it is a symbol of connection between fiancées, drinking from the chalice. The exchange of rings is a gesture of mutual connection. Finally there is a kiss of love and peace. The sacrament of marriage is served in St. Nicolas church for fiancéss and couples (at least one of the couple is baptised). I tis a legal act. For the foreigners (or people who are not baptised) and who would like to have a ceremony in our church, we offer a blessing of their marriage. What is the meaning of Your marriage? The marriage is a sacrament in Czechoslovak Hussite Church. The woman and man are faced to the Word of God. They make a promise of love, fidelity and loyalty to each other. The wedding ceremony contains of annuciation of Word, lacing the stole is a symbol of connection between fiancés, drinking from chalise symbolizes an intimate proximity and it is also a commitment to accept all good and bad moments in your life The exchange of ring is a gesture of mutual connection. Finally, the kiss of love and peace express your love. How can the Czechoslovak Hussite Church help You? The sacrament of marriage or blessing is served in St. Nicolas Church for fiancées and couples. Fiancées have to komplete the premarital preparation or consultation. 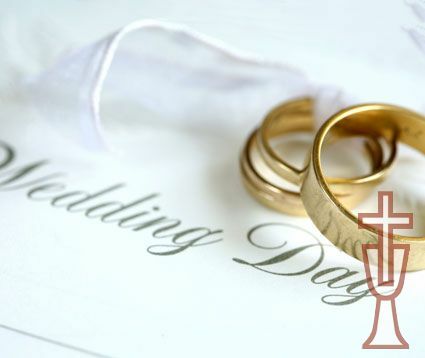 For the foreigners, who would like to have a marriage ceremony in our church (and it is not possible to be baptised in Czechoslovak Hussite Church or take part at premarital preparation courses for them) we offer the special possibility – to have a premarital preparation courses via e-mail or Skype – in English language. We would like to offer you also the spiritualcare: couselling service, discussion and sharing. It is necessary to take care about your marriage and relationship. Maybe You need to talk? All relationships have their ups and downs, but sometimes it is problematic to talk things through or get to a positive solution. The dialogue with clergy or counsellor can make the difference. Whether you are feeling things just are not quite right or whether you are encountering serious difficulties, we are here to listen and to support you towards a positive outcome. We also would like to offer you a connection with other couples in your country (or all around the world). You can contact them via counsellor. May be it can help you to share your life moments with near by people. We also prepare the annual ceremonial meeting in St. Nicolas Church in Prague. How to join the St. Nicolas Marriage Net? It is easy! Just give us your e-mail adress and/or contact phone. We will discuss with you the optimal volume of marrige care. You can contact us everytime you need (via e-mail, phone, skype or personally). Spiritual care and counselling is completely confidential. We will not give your name or any information about you to anyone without your permission. Would You like to join us? Have You any questions or ideas?